Task: Create a new sense. I decided to create a sense to protect your face, eyes or body from too much sun. I started out by getting serial values from a photoresistor on the flora. I tried to start with a Gemma but the debugging aspect was too difficult. I am using the internal pull-up resistor in the flora. I have questions as to what the value of the internal resistor are (I thought it would be a traditional 10 kOhm resistor, maybe I’m wrong) because when I initially started getting serial values, the numbers were flipped and extremely compressed (i.e. larger numbers were in the dark, ~120, and smaller numbers were when light was directly applied, ~15). I mapped the values arbitrarily based on the light that I was working with. Once I got serial values from the photoresistor, I then tried to get tones to play on a speaker. 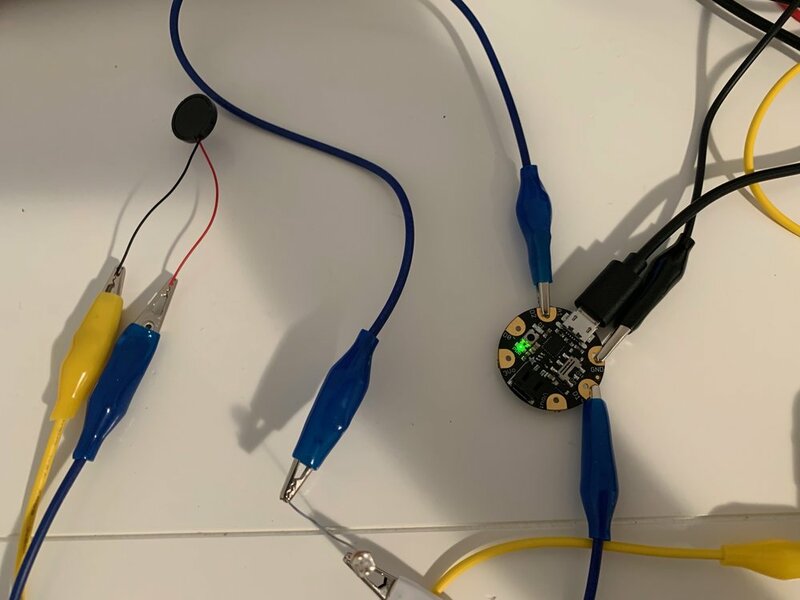 Playing tones with flora is different than the traditional tone library on Arduino, but I think that the microsecond delays are the important part in getting different tones to play. I started out with an Adafruit tutorial to understand how to play tones with flora. I decided to add longer and higher toned beeps when more light was present and short, low toned beeps when a small amount of light was present. When there was an insignificant amount of light, nothing is played. After I got it working on flora, I moved the circuit over to Gemma and got it to work. I wanted to work with the Gemma cause the size is small and I wanted the user to wear it on their head. After getting Gemma to work, which is kind of difficult because I don’t know how long to press the reset button in order to upload new code onto it, I worked on sewing the circuit. I tried to map it out, but I just kind of put on the Gemma and placed things according to that. I think wearables is difficult because it’s hard to hide all the circuitry while also planning out the best route for sewing since everything is semi-permanent. 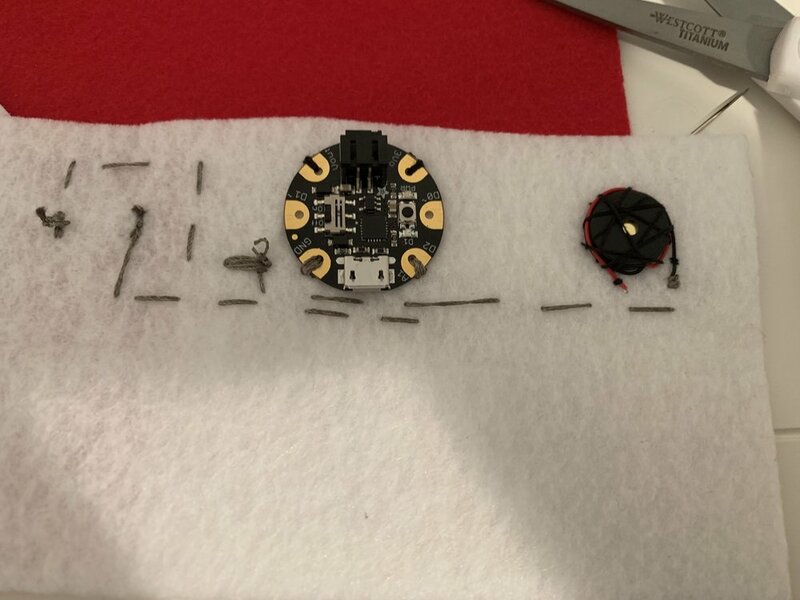 While I was sewing the speaker, I didn’t want to risk soldering and messing it up, so I kind of came up with a solution of sewing it down a lot and it worked. 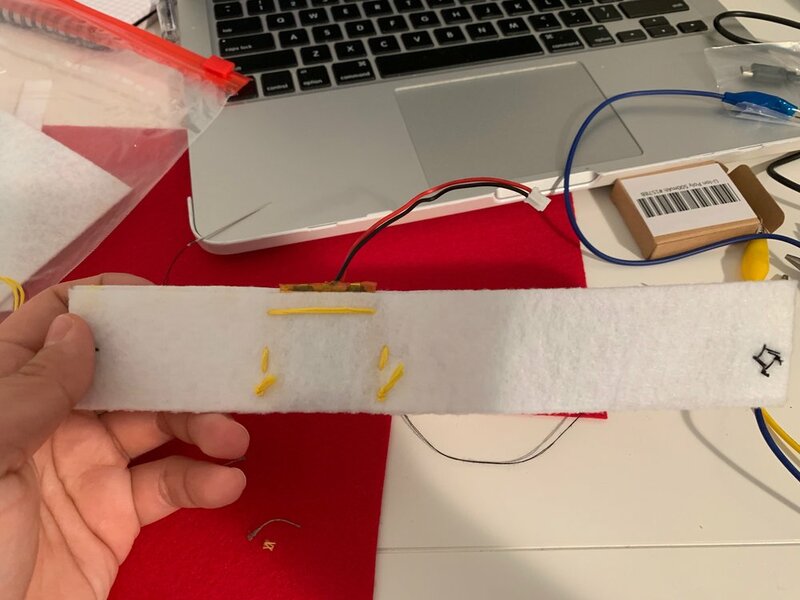 I added and extra layer of felt to hide the circuit minus the photoresistor. I used that to hold the battery for the Gemma. I added yarn to tie the band around ones head because I didn’t have enough fabric for a whole head and I wanted to be able to include all head sizes. Below are my documentation photos, final photos and a video of the circuit in action.